If you are a fast typist who sends a lot of emails during your typical day, then you know how common it is for misspellings to make their way into emails. But when you are working in a professional environment, incorrectly spelled words can have a negative impact on your relationships with coworkers and clients. 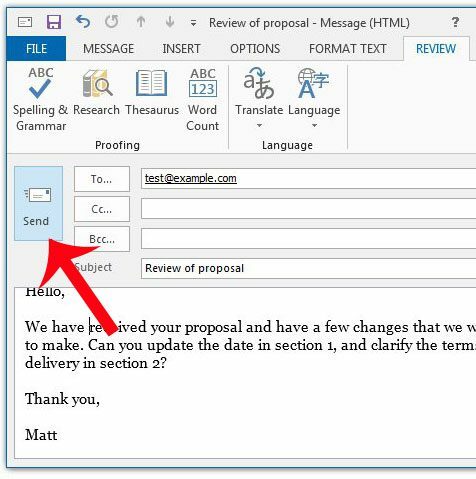 So it is a good idea to learn how to spell check an email in Outlook 2013. 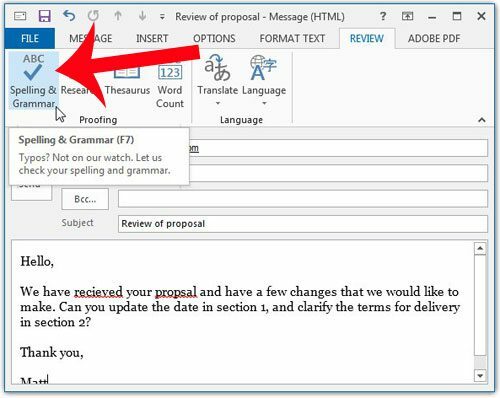 Our short tutorial will show you how to run spell check on an email that you have written, and it will show you how to manage any misspellings that the spell checker encounters. 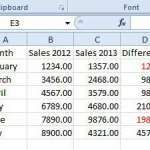 The steps in this article will show you how to run spell check on an email message that you have written with Outlook 2013. 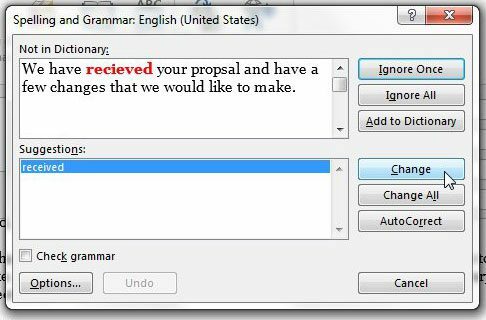 It will also offer suggestions for any misspellings, based upon which word Outlook thinks you were attempting to write. 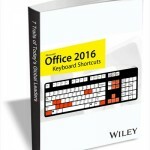 Step 1: Open Outlook 2013 and write the message that you want to send. Step 3: Click the Spelling & Grammar button in the Proofing section of the navigational ribbon. Step 4: Choose the Ignore the change if the word is spelled correctly, or choose to Change it if it is spelled incorrectly. 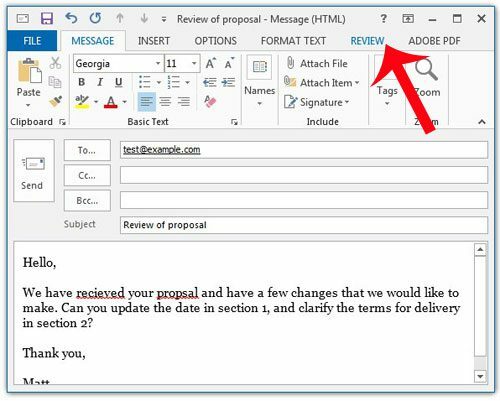 Is you select the Change option, Outlook will replace the misspelled word with the one that is currently highlighted in the Suggestions pane at the bottom of the window. Note that you can also choose the Ignore All of Change All option if you have misspelled the same word multiple times in the email. Step 5: Click the OK button on the pop-up window after you have checked every misspelled word in the document. Step 6: Click the Send button to send the proofread message. Do you have an email signature that is attached to all of your outgoing messages, but some of the information is incorrect? 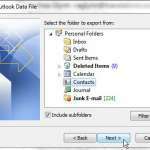 This article will show you how to modify your signature in Outlook 2013.